Love those jalapeño poppers on the appetizer menu at every restaurant these days? They're a delicious, cheesy treat that packs a lot of heat, but making jalapeño poppers at home by hand can be a time-consuming and messy process. This creative jalapeño popper dip recipe has the great spicy taste of fried jalapeño poppers without all the extra work. It can be made ahead of time, but you'll need to prep your butter and cream cheese in advance. In a food processor, combine the softened cream cheese, mayonnaise, shredded cheese, 1/2 cup of the Parmesan cheese, the green chilies, and jalapeños and process until smooth. You do not need to drain the can of jalapeños or the can of chiles, but if you prefer a dip that's a little less creamy, you can omit these juices. 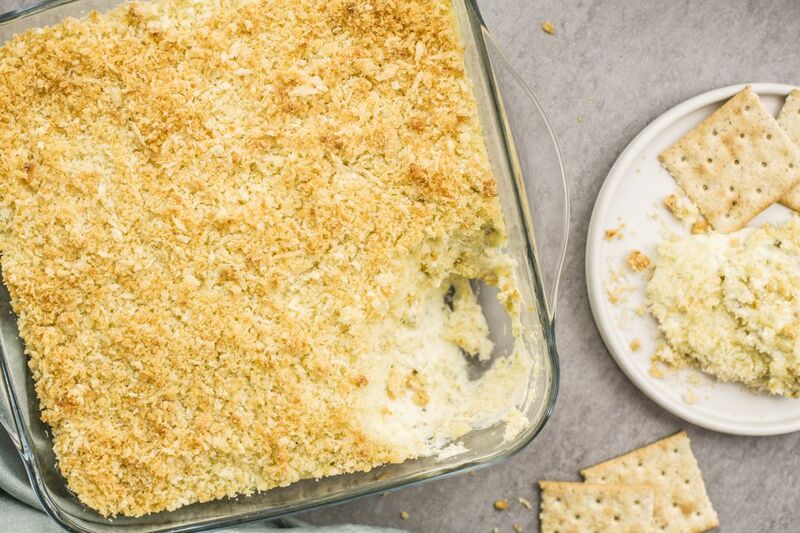 Spread the dip into a greased 2-quart casserole. In a medium bowl, mix the panko breadcrumbs, the remaining 1/2 cup of Parmesan cheese, and the melted butter. Sprinkle the crumb mixture evenly over the dip. Bake for about 20 minutes, or until the top is golden brown, the dip is heated through and bubbles gently on the edges. Serve the dip warm with buttery crackers or a sliced French bread. Do not overcook this dip or the mayonnaise will separate and you will have a grease puddle in your dip. Be very careful when handling the peppers and chiles; they're hot and can actually burn the skin on your hands. Ideally, use gloves whenever you touch them, even if it's just taking them out of the can. Whatever you do, don't touch your eyes after touching jalapeños or other very hot peppers. You can assemble the dip up to one day ahead and refrigerate it, then bake just before serving.